It’s November 15, 2013. Twenty-five thousand people descend on San Francisco. Online, two billion others join in. This massive crowd erupts with a collective display of public emotion rarely seen. With a Beatlemania-like intensity, people take to the streets and screens. They are all united to fulfill the wish of 5-year-old Miles Scott, who is recovering from Leukemia. It is his dream to become Batkid and save Gotham City. 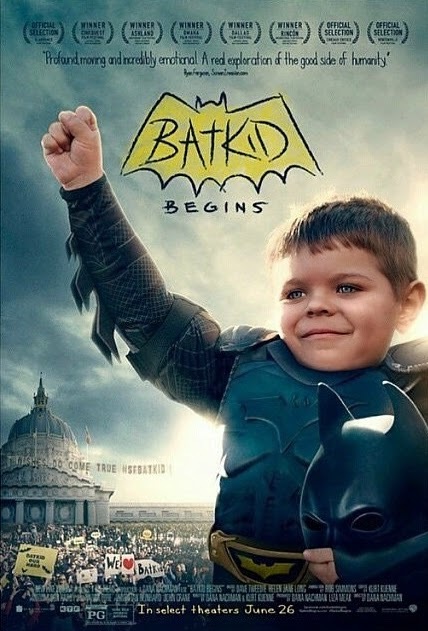 "Batkid Begins" chronicles the making of the overnight international phenomenon that is Batkid. The film reveals what happens when an event goes unintentionally viral. Will the San Francisco Make-A-Wish Foundation fulfill its mission to help Miles reclaim his childhood after battling disease for more than half his short life? Or will the event itself spiral out of control; consume the organization, scare Miles and shut down an entire city? Audiences will come along as Patricia Wilson, executive director of the San Francisco Make-A-Wish chapter, and her team - in true superhero spirit - tackle the monster they created. get lost in a nightmare? Featuring exclusive illuminating interviews with all the main players including executives at Twitter and Apple, the film reveals surprising truths about what happens when a nerve is touched in our digital society. The film looks at the “why” of this phenomenon. Why did the intense outpouring of spontaneous support for a five-year-old reverberate around the world? In the end, the film leaves audiences to decide; did Miles need the world for inspiration? Or did the world need Miles? In select theaters on June 26th, 2015!